A color hold is a technique where the linework becomes a color rather than black (or different from the rest of the linework in color). Here is the way I prepare my files for color holds. In 'A' I have my scanned artwork (greyscale) and I have made a duplicate layer of it that I named 'masterhold'. Using the 'select color' tool, I select white. There is a sensitivity adjustment that I found works well for me at '150'. Then I'll clear (delete) the white. In step 'B' I adjust the contrast down and the brightness up. This takes out some of the stray variant pixels so that everything is even, it also helps show me that this is not black linework, it's going to be a hold. Notice that with no other layers visible, 'masterhold' is transparent everywhere but the line work and is set to layer mode 'normal' (unlike a lineart layer that I set to 'multiply as I mentioned before). Step 'C' shows where I have erased all the areas on 'masterhold' that I don't want held as a color, leaving just the decorative swirls to be painted any color. 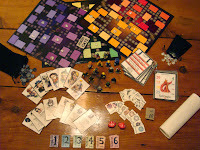 This week is New Year's Eve, which means Tower, the board game I made is dragged out and played by our guests. 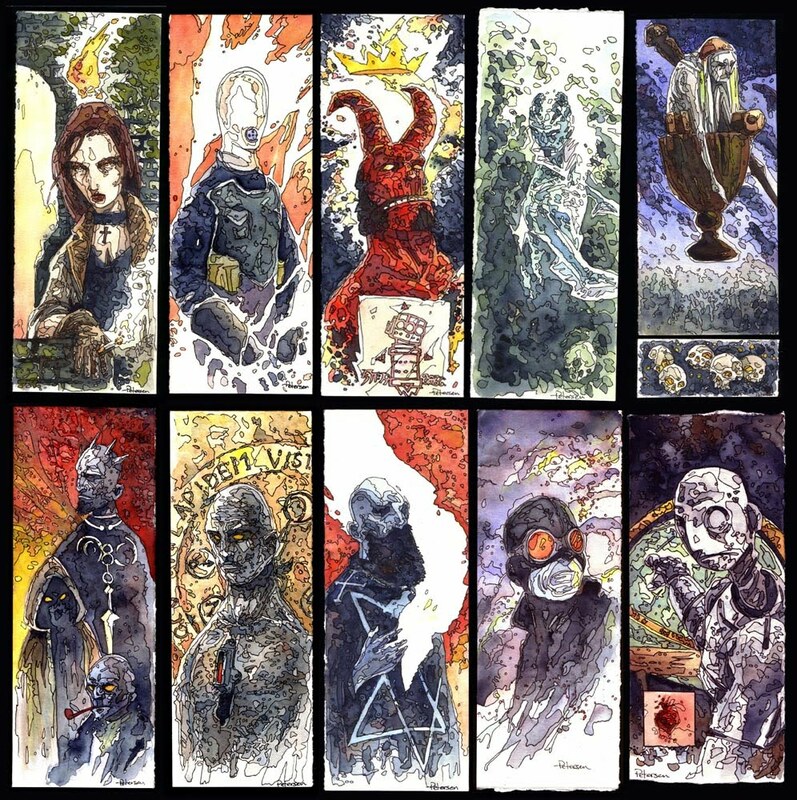 I found a bunch of the artwork I did nearly a decade ago for the character cards. As I mentioned before part of the goal was to make more diverse characters for Tower than it's predecessor Dungeon had. 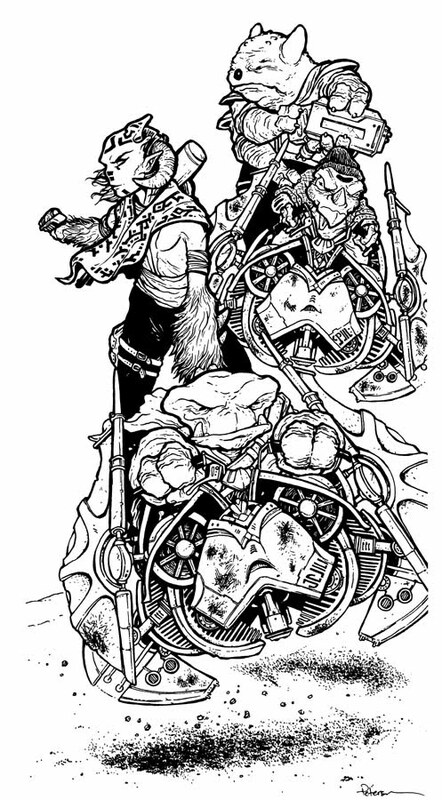 Many of our old D&D characters served as inspiration. 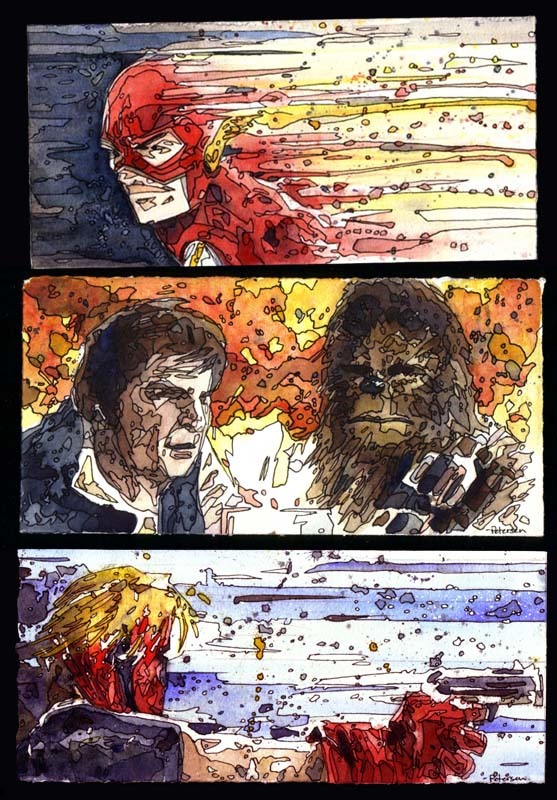 These were mainly done with a black ballpoint pen and watercolor pencils. Packus: His design is somewhere between George Lucas and the Pringles logo. Madaline: A character that was in the TSR Dungeon game we based Tower on, thought it would be fun to carry her over. Ninja: This is where we were getting desperate for ideas. Dalton: Was based on a guy my friend Seyth and I worked with at Starbucks. I think we included him because he wouldn't like the idea of being included. 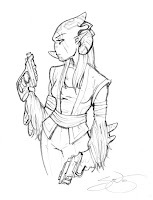 Solae: I have a soft spot of this drawing, and I can't even tell you why. Luthor: Looks like I was inspired by some anime here. 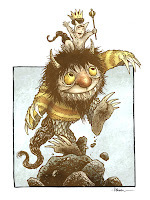 Fisher: This was Seyth's long standing D&D Dwarf character. He is way too powerful in the game Pax: She was a fill-in character we made up who had her name changed a lot. Jhan: Based on Seyth's roommate in college 'Silverthatch' was a joke because he wanted to dye his hair silver. Annice: This one of the other character portraits I'm happy with and I can't point out why. Derek & Nikki Davis of Bitter Tea Studios gave me this original strip from their online webcomic. This one they said was inspired by Mouse Guard. Thanks for the art and including mice of daring-do in your comic Derek & Nikki! For our first Christmas as a married couple, I made a nativity set for Julia. I have loved nativity sets since I was a kid. This set I made mainly out of wooden frame stock for stained glass windows that I had left over. 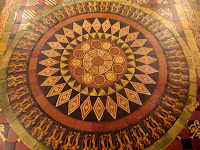 The textures were achieved through wood carving tools, branding the wood with various tools, and a dremmel. I also made use of 5-6 different wood stains and assembled the pieces after the stain had dried. I wasn't able to handmake a gift this year, but wanted to share this one that we love bringing out every year. I also want to wish all my fans a wonderful Holiday! Last post I showed the way that I layer my color in photoshop. This time I want to revisit the method that I 'render' the colors. I start with a base color for every area and then use the dodge and burn tool to add the shading and highlights. The Dodge and Burn tool (circled in green) allow you to lighten (dodge) and darken (burn) the colors. Each tool has a setting (circled in red) as to which range of colors it will effect the most, but that setting also effects how it darkens or lightens. I did a few quick spot samples to show that burn on medium (B-M) tends to saturate the color as it darkens, just as dodge on highlights (B-H) saturates as it lightens. While burn on highlights (B-H) and dodge on medium (D-M) desaturate as they do their jobs. I also want to point out that you can use any of the various brushes with dodge and burn and also alter the 'exposure' (strength) to your liking. Last week Katie Cook and I joined Jamie D, Shane, and Adam 'Murd' Murdough on Comic Geek Speak for an All-Muppet themed episode. While recording I brought up that as a kid I had the Kermit Fisher Price Puppet, but none of the others (I have them now thanks to ebay) but it led me to build my own. After the CGS show I dug out my VHS tape of me working on them and took some screencaps of me as an awkward looking pre-teen holding up my handmade Muppet puppets . 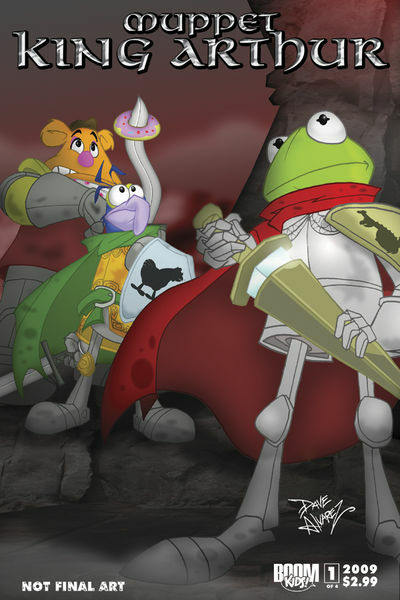 The Comic Geek Speak Muppet episode is available now through the CGS IPhone app, and will be released on their website for non-IPhone users in a few months. After watching Karl Kerschl do a live video stream from his drawing table on ustream.tv, I thought I'd like to give it a shot. I have done two of them now, and I really enjoyed them. I have a mic going so the viewers can hear me (as well as either see my drawing table or my PC desktop). I read the chat messages that come in from viewers as I'm working so in addition to talking about whatever process I'm working on, I can answer your specific questions. This piece is one that I inked and colored last Sunday on ustream. There are no specific times for when I'll do the next stream, but I post notices with links on Facebook and Twitter the day I plan to do one. Unexpectedly in the mail today a package from Evan 'Doc' Shaner arrived. 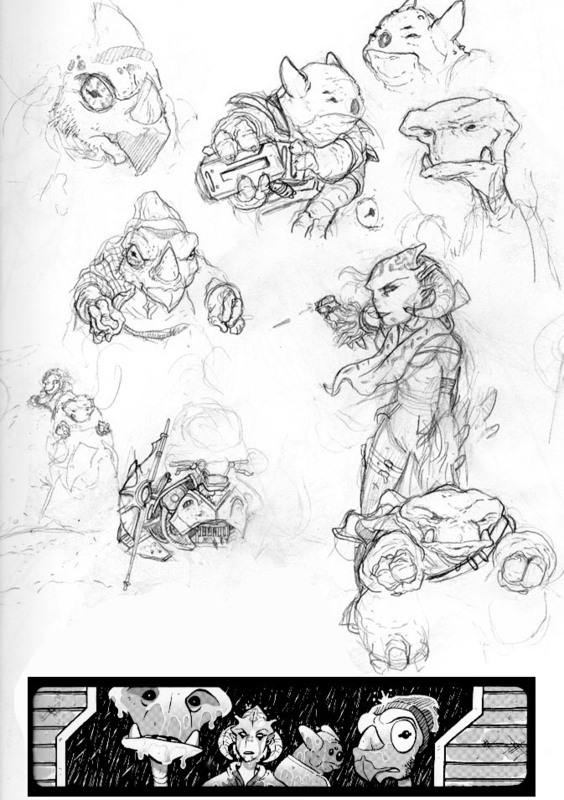 He sent me this original art featuring my mice along with Hellboy and Abe Sapien! I really like that the Black Axe and the Right Hand of Doom are touching...very epic. Thanks Evan! 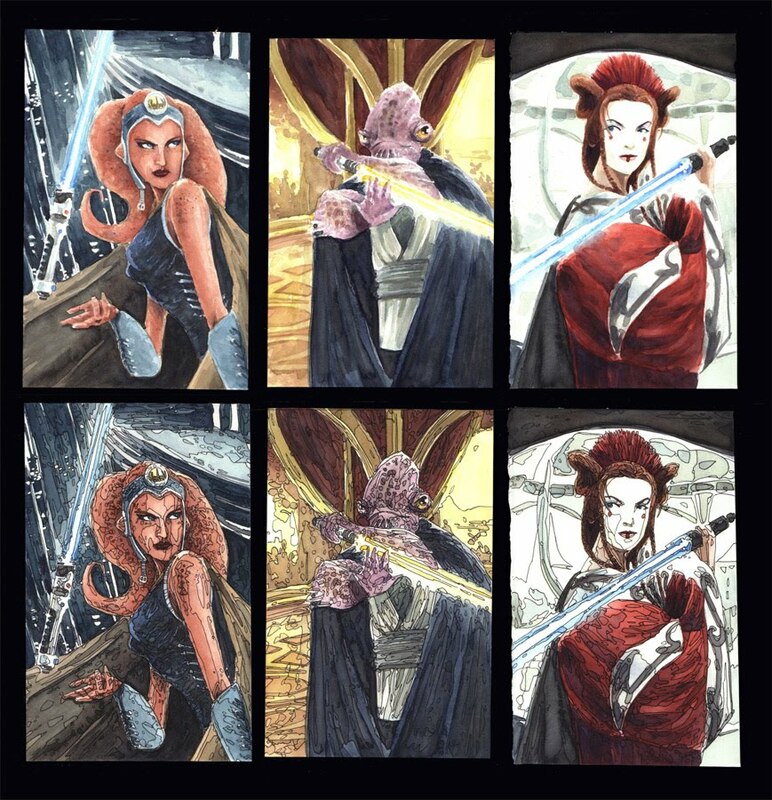 I get asked about my coloring techniques in e-mails and at conventions, so I wanted to start posting some basics. I am a self-taught photoshop user, and that there may be better ways, or other ways to meet the same end, but these are the steps I take. I also want to mention that while I'm using Photoshop 7, what I'm showing will apply to any version of Photoshop older than 5.0. When I started, learning to color, I read a tutorial on coloring (here). However, I found the method of using channels a bit complicated for my simple mind, and tend to do everything just utilizing layers. I place my scanned linework into a new file and label the layer 'Linework'. Using the dropdown for layer modes, I set 'Lineart' to multiply. 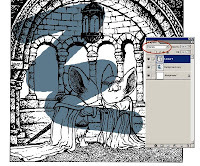 Multiply means that photoshop will read anything that is white as transparent and anything black as opaque (greys become a % of opacity based on their tonal value). On this example, you can see that I have set the 'Lineart' layer to multiply (dropdown circled) and made a new layer to splash some color on so you can see how the setting allows the color to be seen in the white parts of the drawing. You may notice that Photoshop makes a layer called 'Background' automatically. I never try and do anything to this layer. I only put color on new layers I make so that anywhere I didn't put color on any given layer is transparent (opposed to the 'Background' that starts as a default of white). I make a new layer for any new area of color. If I dislike how something looks, it's easy for me to re-isolate that area (even after I have rendered it) by selecting it's layer to make changes. Also if I continually make new layers under my most recent color layer, I may already have established the edge of an area and won't have to be as careful drawing the next color in. In this simplified example you can see how the layers stack up: Lineart on top (set to multiply) with multiple new color layers underneath (labeled fur, skin, cloaks, etc. ), and an untouched background on the bottom. The awesome Katie Cook had a birthday last week so I did a Where the Wild Things Are piece for her. It was fun to draw and color and easy to part with when I knew it was going to such a good home of geekdom. Happy belated Birthday Katie! Austin Wilson sent in this photo of his Lieam plushie guarding his Christmas tree. Thanks Austin! If any other fans want to share their fan artwork (photos, drawings, sculptures, etc.) send it to me through the contact link on mouseguard.net. While working on a cover for Legends of the Guard (which I can't show yet), I wanted to feature an architectural library setting. 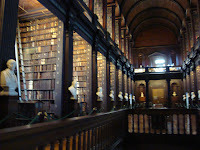 I looked through my reference photos from Ireland and found this one that I took at the Trinity college library (where photography was prohibited, so excuse the out-of-the-coat-quick-shot blurriness). However, I wanted to go beyond this photo and make something more Mouse-Guardish. I hate figuring out these things in perspective. 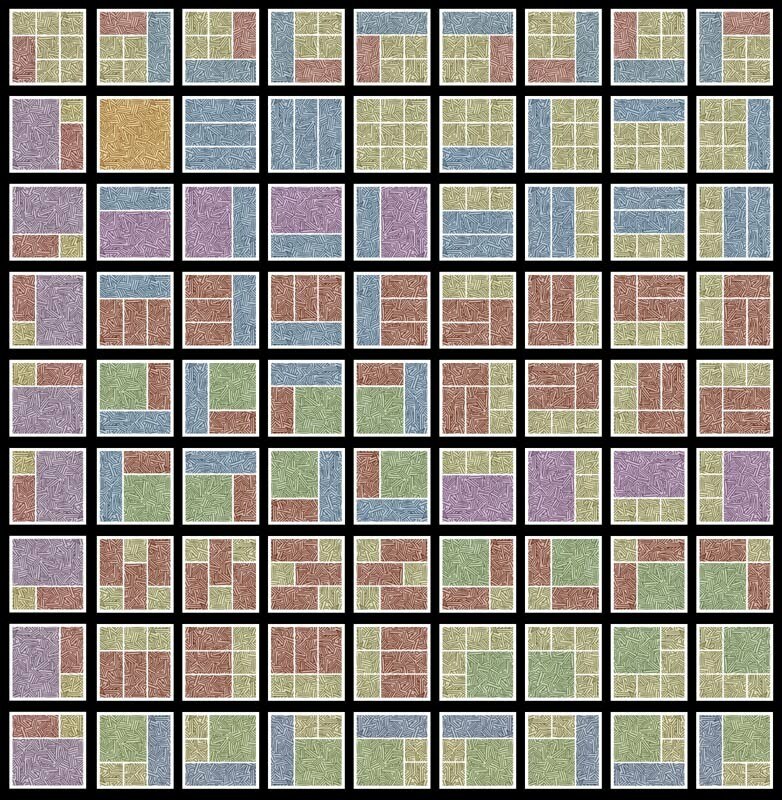 It takes me forever to get all the layout lines and construction lines for concentric circles, etc. So I find it more rewarding, and enjoyable to make a model. 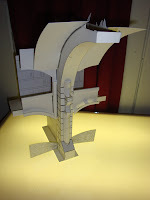 After a sketch of what one column would look like, I built this model piece. It's all made from left over bristol board scraps and rubber cement. This took about an hour or two to build while I listened to an audio book. I drew in details like the book shelves and the column's mortar lines to that I would have to refigure those perspective lines again later. When you do this type of modular model with only one section built, the plan is to use the piece over and over to fill up the entire building. I had to make sure the arch and balcony sections extended far enough that they would meet when I composited everything together. This rough floor plan shows how the one section would get moved down again and again to become the full model. On our dining room table I taped down two lines of blue painters tape (low tack so it wouldn't hurt the table). I made sure they were parallel and marked off even increments noting where the model needed to be placed on each side. I set up a tripod and photographed the model in each spot on the tape lines. Then using photoshop, I composited all the photos together to make this photo I could reference. I know some would say that I could have spent less time just working out the perspective, but I like how this method leads to imperfections and lines that are not 100% on the perspective lines. It makes it seem like a real place that mice would have built. It has settled and it's no longer geometrically perfect, which my perspective drawing would have been. Boom hasn't previewed this anywhere yet, but I saw a few sites that sell comics online have already posted an image (though the colors are oversaturated and wrong), so I figured I should give fans the better image. Issue #3 is the grail issue. It took some self control not to put the "Legendary Black Beast of Aaaaarrrrrrggghhh" From Python's Holy Grail. 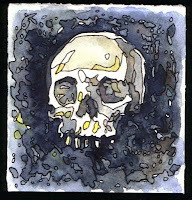 Watercolor paintings c.2004:While I love watercolor as a medium, I always struggled with feeling like my watercolors were good enough to stand alone without ink line to help. 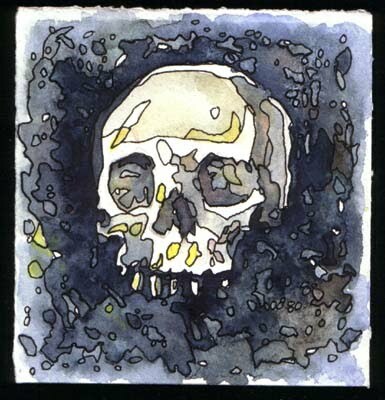 So around 2002/2003 I started playing with the idea of painting loose and then going back over with pen to isolate shapes that were variations of color or stroke or form. It got me going on a kick of painting superheroes & comic book characters. I was using paper that I had purchased and cut for our wedding invitations that was left over. In fact, some of these (all of them have sold or be given away long ago) may have the hand stamped image of leaves intertwining from our wedding on the back of them. The trick, I found, was to have a painting that was loose enough to need the linework, but strong enough that the forms were still all there without line. The balance between the watercolor and line wasn't always what I wanted. Sometimes I felt I would overuse the line, while other times I felt I had overpainted the painting. I found that using negative space and strong lighting composition helped to not make the paintings turn into 'stained glass mud'. I would tend to work on multiple pieces at one time so that as one was drying I could be working actively on the next, and then back to the dry one, etc. This was at a time before I had started working on Mouse Guard as a comic series. I thought that these types of paintings would be good examples of my work that may generate commissions as well as be saleable items. 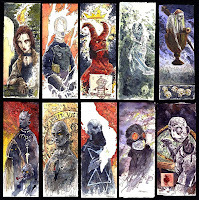 As Mouse Guard started coming out, I thought it would be foolish to drop the paintings from my convention display. 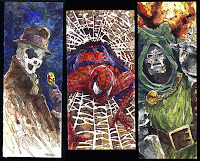 So every con, I was painting a series of characters that all went together. 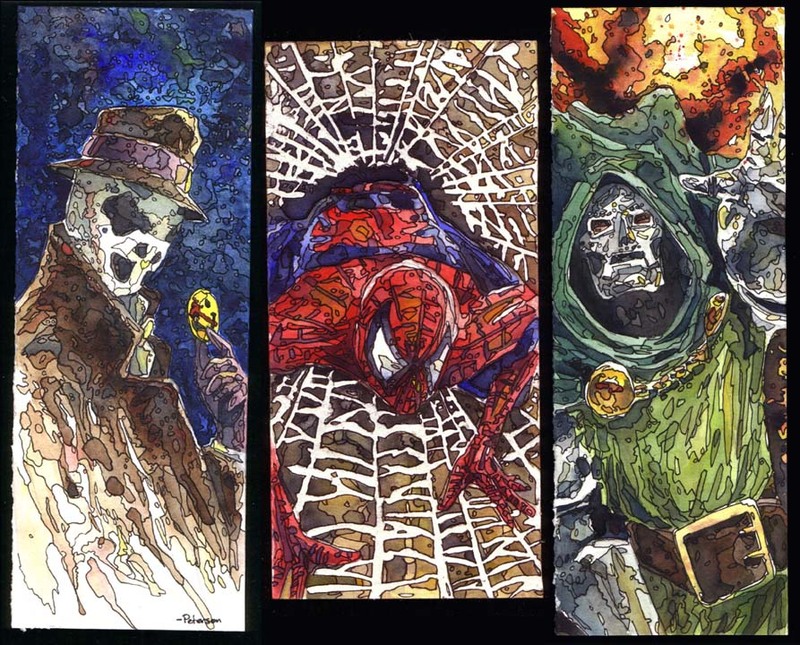 The first of which was the Arkham Asylum lineup. I sold limited prints in little manila envelopes (printed with stencil lettering "Arkham Files" and printed coffee-ring stains) to help my table sales for those unfamiliar or uninterested in Mouse Guard. 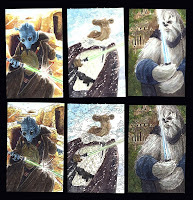 The last set of these I did was a grouping of Jedi. 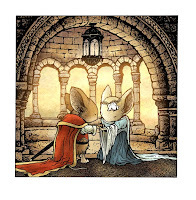 Mouse guard was strong enough on it's own and not having a relationship with the companies and publishers who owned copyright on the characters I felt I was pushing my luck. 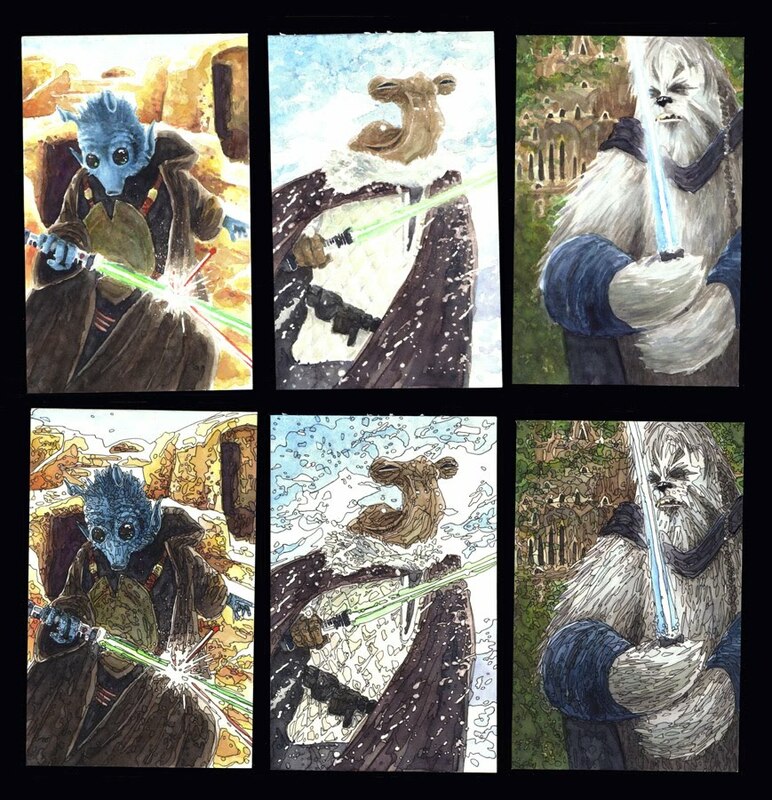 I picked 6 species (Twi'leck, Mon Calamari, Human, Rodian, Ithorian, & Wookiee) set them on different locations (Coruscant, Naboo, Kamino, Tatooine, Hoth, & Kashyyyk) and gave them all lightsabers. This set I was happier with the original watercolors than usual, so I scanned the un-inked versions in case I preferred them. Here you can see the whole set in original and final states. Fan Art:Bo Harris gave this color pencil and ink drawing to me at the Windy City Con last Sept. 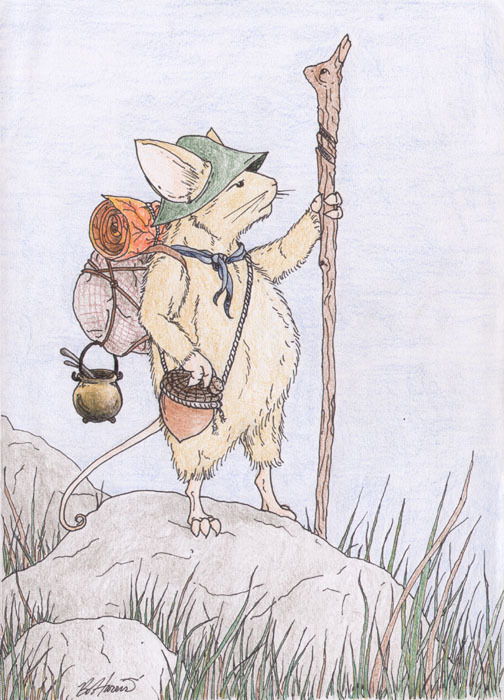 I like how alone and unfettered to civilization this mouse is. He looks pretty self-sufficient. Thanks Bo! 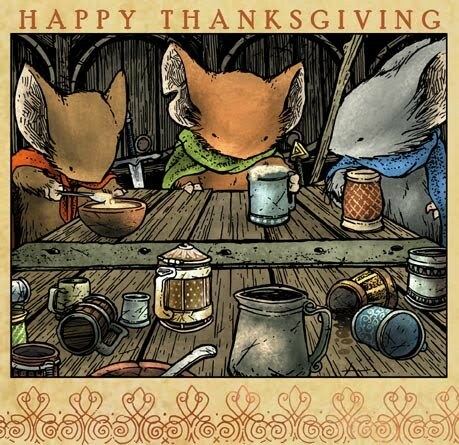 And if you have Mouse Guard fan art you want to share, email me through the mouseguard.net contact info to send me your work. 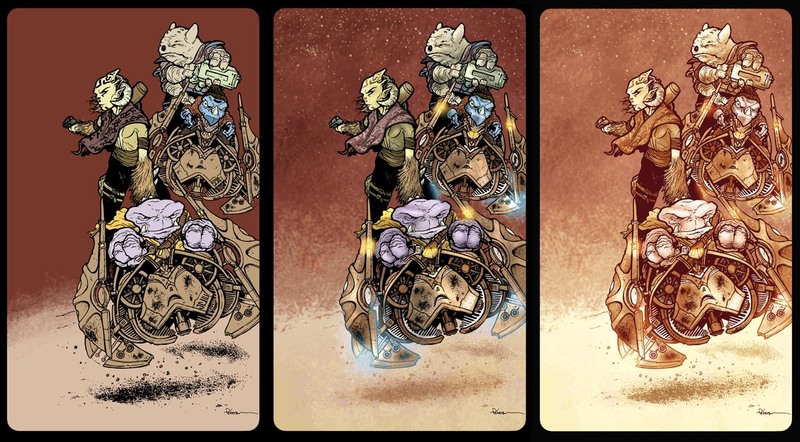 Since Sean Wang's Runners: The Big Snow Job just wrapped it's first issue over at runnersunivers.com, I thought I'd show the process on how I did the pinup piece for him (an exchange for the pinup he did for Mouse Guard Winter #5). I started with my sketchbook and the section from the first Runners Arc I wanted to tackle (the old crew's hijinks...see inset panel). At this point I'm doing some rough layout ideas, but also getting a feel for the characters and their poses. After scanning the sketches I can manipulate them separately and tone them to make it easier to keep track of what lines belong to whom. The ships they are riding were based in part on an iPod recharger. I only sketched one half of it, but was able to just mirror it in photoshop. At this stage I can also fix anatomy errors, like heads being to small or needing to be tilted. 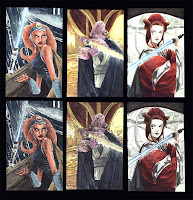 This composite technique allows me to get a final layout without having to do much (if any) redrawing. I printed out the composite and used a lightbox to ink straight onto the bristol using my printout as a guide. As I mentioned in a previous post on lightbox use, I tend not to re-pencil, but to ink directly off my roughs. 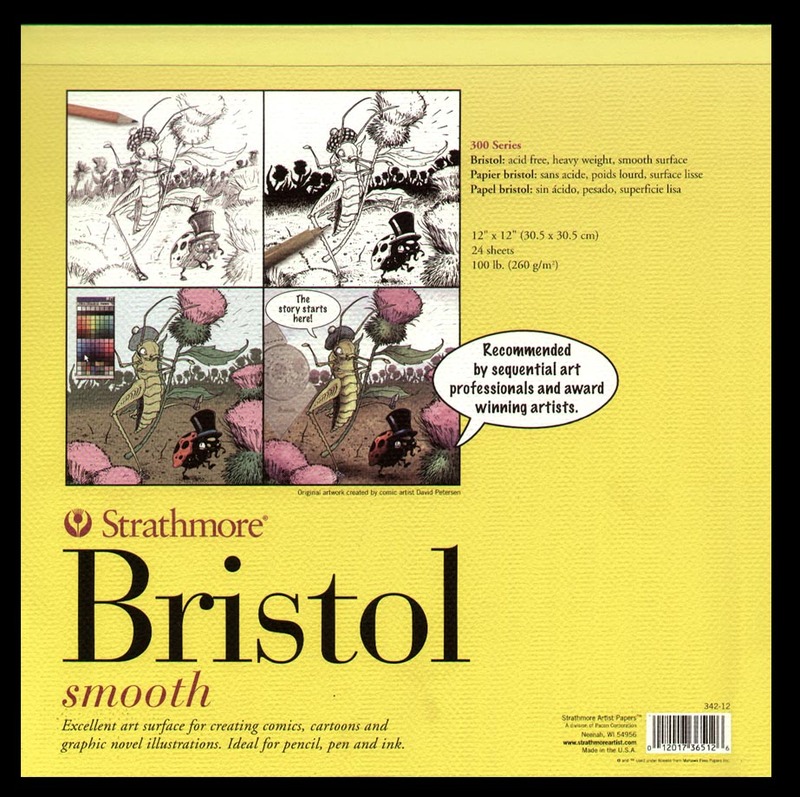 This helps keep the paper clean of pencil, and cuts out a step where I may tighten up and lose some life from my sketch. Inking is where a lot of the look of the final artwork comes into play. I focus on textures and line weights to make sure the forms are readable and that fabric is moving like fabric, fur like fur, etc. Then after scanning it, I work with 'flatting' the colors in. 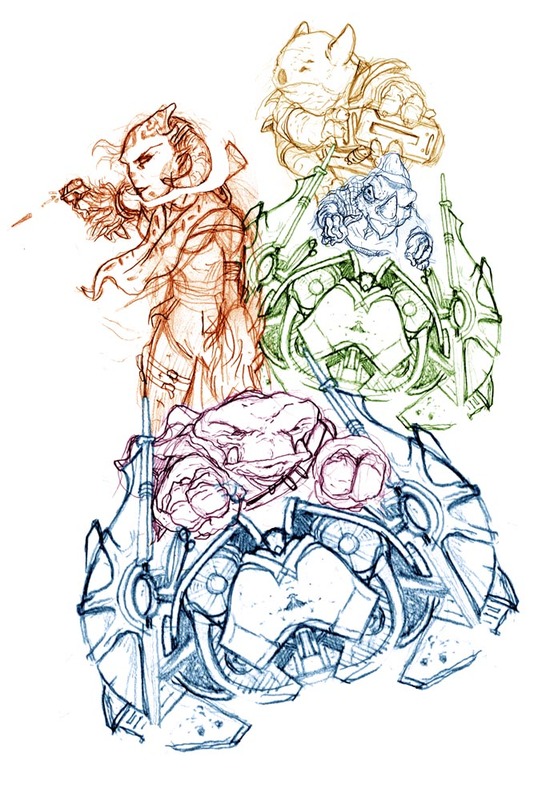 This means picking rough colors and assigning where they go (where a shirt ends and an arm begins for example). Then I started adding the shading and painterly touches and light effects. Lastly I wasn't thrilled about how the palette turned out when I used the 'real' colors and since the 'old crew' were shown via flashbacks in the first Runners arc, I opted to go with a toned/muted palette for the final art. 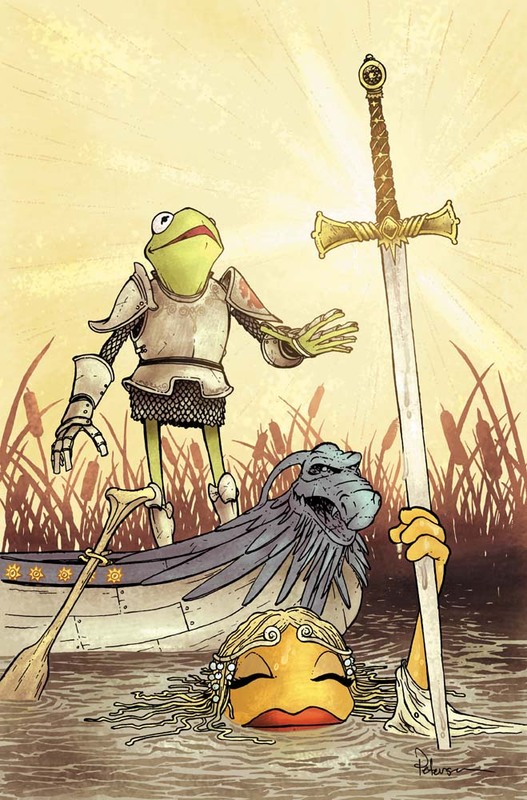 Due to art not being ready on time, Many fans may have seen my Muppet #1 cover solicited in Diamond on various sites online as the #2 issue cover. To my knowledge this cover will be printed on issue #1 (I'm now working on #2 so it can be in on time for it's printing). With Arthur's symbol being a dragon, I opted for Uncle Deadly to be the masthead of his boat and a small bearded dragon to be the design on his shoulder armor. Dave Alvarez (artist on the series) went with a La Choy Dragon homage for his cover. For us here in the States, Thanksgiving is this week. I have a great deal to be thankful for, chief among them my Wife, family, & friends. However, I wouldn't have the success I do without you folks out there who are fans of my work, so Thank You. I mean it. I have a career because people enjoy my work and I don't ever want to take that for granted. Fan Art:Should have posted this for Halloween, but better late than never. 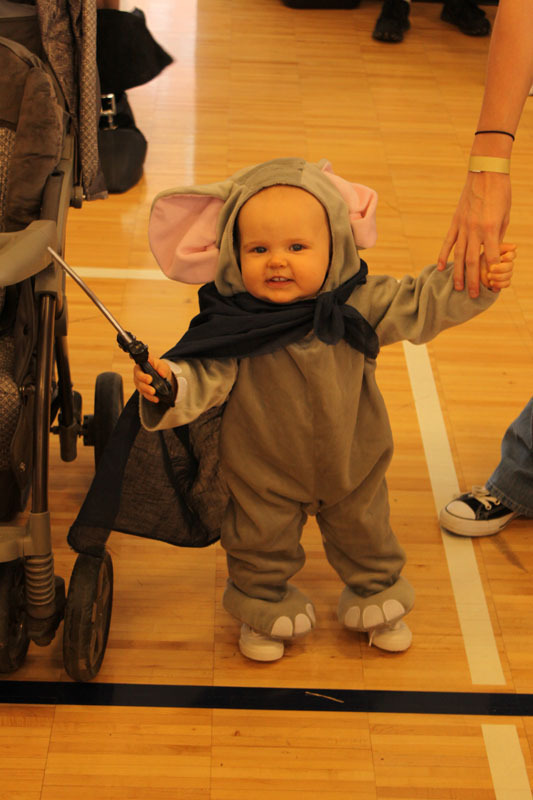 Fans of the book brought their baby dressed in a Mouse Guard costume to the Windy city con back in September. Pretty adorable! and remember, if you have Mouse guard fan art you want to share, email me through the mouseguard.net contact info to send me your work. 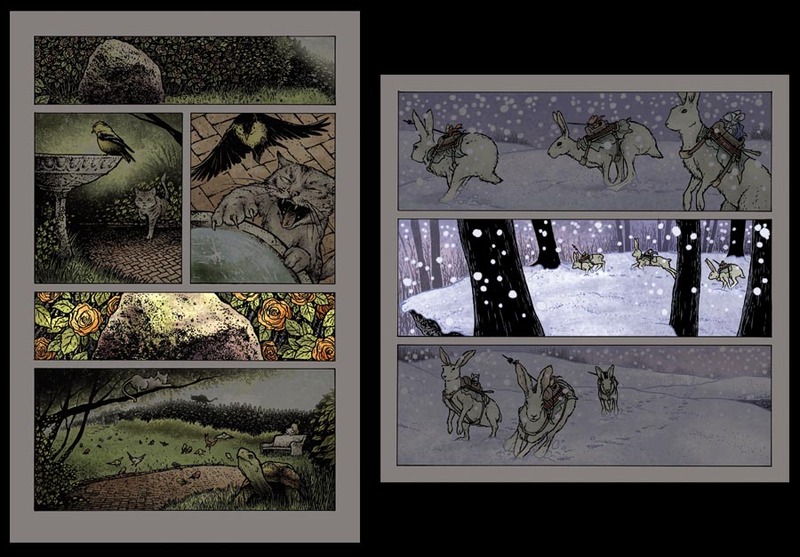 When Mouse Guard first came out, one of the things people noticed about it right away was it's odd format. There were folks who loved it for being different, and folks who hated it because it was hard to store or display. 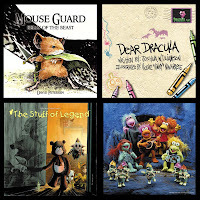 And while it was an unusual decision on my part (and Archaia's willingness to publish it that way) it seems that the square format is becoming more popular with titles like Dear Dracula, Stuff of Legend, & the upcoming Archaia Fraggle Rock comic. 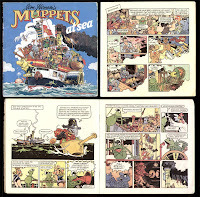 As a kid I had a Muppet comic called Muppets at Sea. 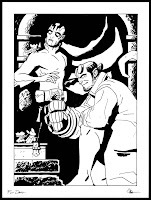 It was lost at some point and a few years ago I remembered it and tracked it down on ebay...only to find that it was an 8" x 8" square comic! The panel borders even tend to be divided on the 1/3 page lines. 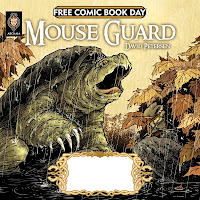 I have no clue if the residual memory of this book (I didn't own a copy when I started Mouse Guard and hadn't seen mine in a decade) influenced my format or not, but it was fun to see the commonality. My path to square started with the idea of mini comics (comics made by folding standard copy paper in half). To stand out, I had the idea of using legal sized copy paper (8.5" x 14") instead of the traditional letter sized paper (8.5" x 11"). 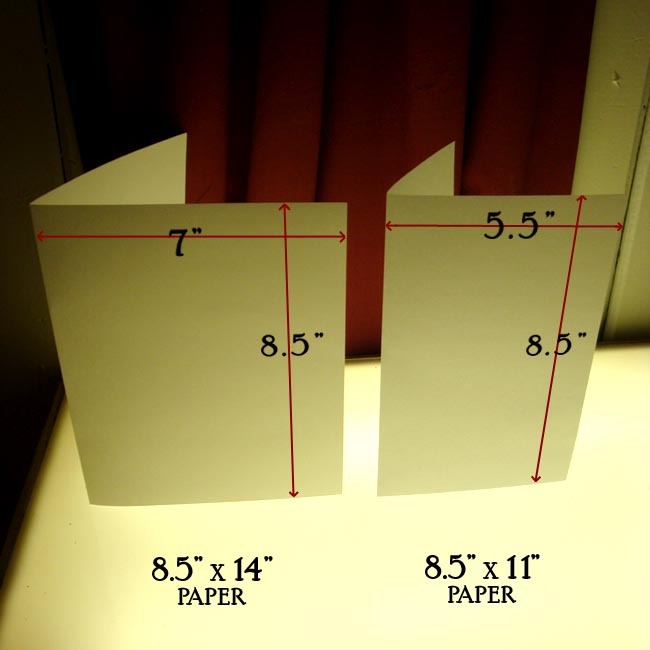 This would give me something different without increasing my costs like colored paper stock or color printing would. The resulting mini comic had a heavier horizontal weight and I liked that. And though I never ended up printing a mini comic, the few sketches of panel layouts I did helped me see my horizontal bias. 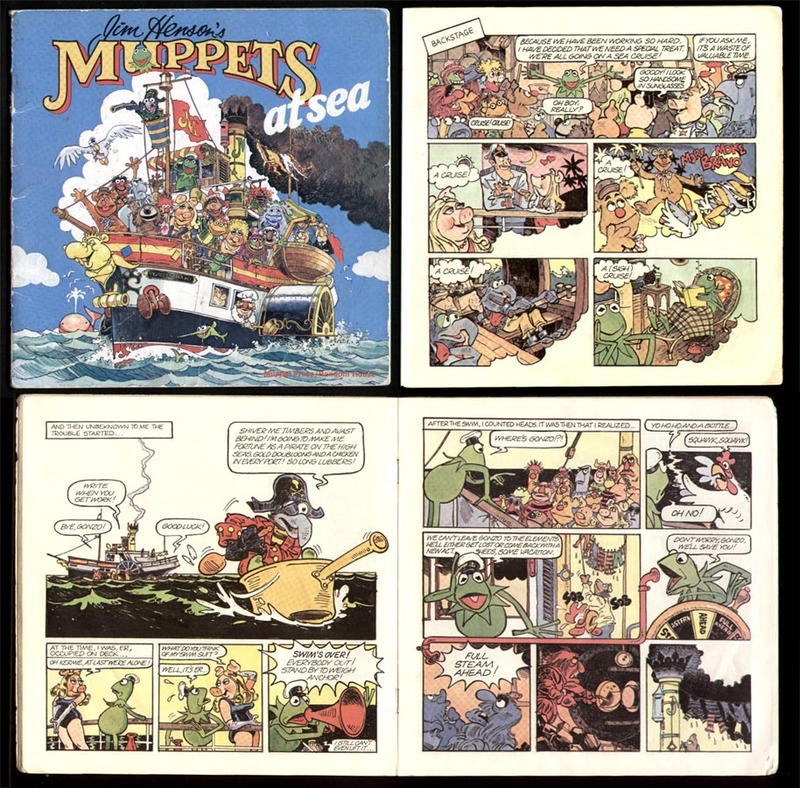 As I mentioned with the Muppets at Sea comic, I tend to break the panels on the 1/3 lines (or the 9 panel grid). There have only been a handful of times that I have strayed from those grid lines. 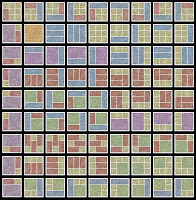 I find comfort in having a set grouping of panel arrangements to work in, but still a great deal of freedom because with mirroring or rotating those panel arrangements, I have lots, and lots, and lots of options (shown here are still not every combination of readable layouts). Last year the folks at Strathmore Paper approached me to do illustrations for and to promote their new line of sequential paper line (with Katie Cook and Tommy Castillo). 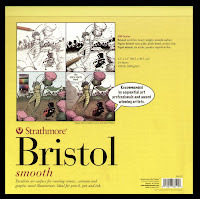 I was already using Strathmore at the time, so I was excited about the idea. While I had them there, I asked for a quote on having them cut and bind custom pads for me at 12" x 12" of their 300 series bristol. I had been buying 14" x 17" and trimming each sheet down. They offered to make it part of their new line of products for comic artists. I explained that it isn't a standard size for comic artists and doesn't really belong there, they smiled and included it anyhow. Guess they were on to something. Home from Ireland and London! I apologize that I'm typing this up so late in the week. I had been trying to post on Tues. each week, but after two weeks away and flying over an ocean to get home, there was no way I was going to be able to type anything of substance. The trip was wonderful. Julia and I had a lovely time and saved some money by staying with relatives and exploring Northern Ireland and London for my signing there. I got a lot of great inspiration and Irish reference for the upcoming series. 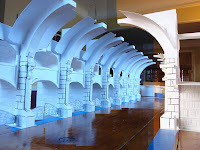 I have a wonderful batch of photos that I will reference for architecture, carved details, tile work, stained glass, library design, etc for future Mouse Guard stories. Julia acted a photojournalist for me and took a great many photos with her camera (an SLR that I'm only allowed to play with if I ask). She has been spending the day processing those photos so she can upload and share them with everyone. 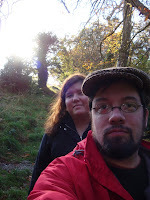 A few additional ideas came out of our travels for a project I plan on when I need a break from Mouse Guard (not anytime soon) called Fir Darrig, which is set in Irish folklore. The trip will be influencing my work and I hope you enjoy. 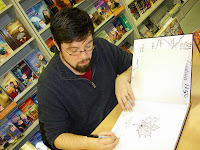 But this trip was work too, we were in London for a few days as well which allowed me to do a signing at Forbidden Planet. The folks there were amazing and I really appreciate the warm and polite welcome from my UK fans. 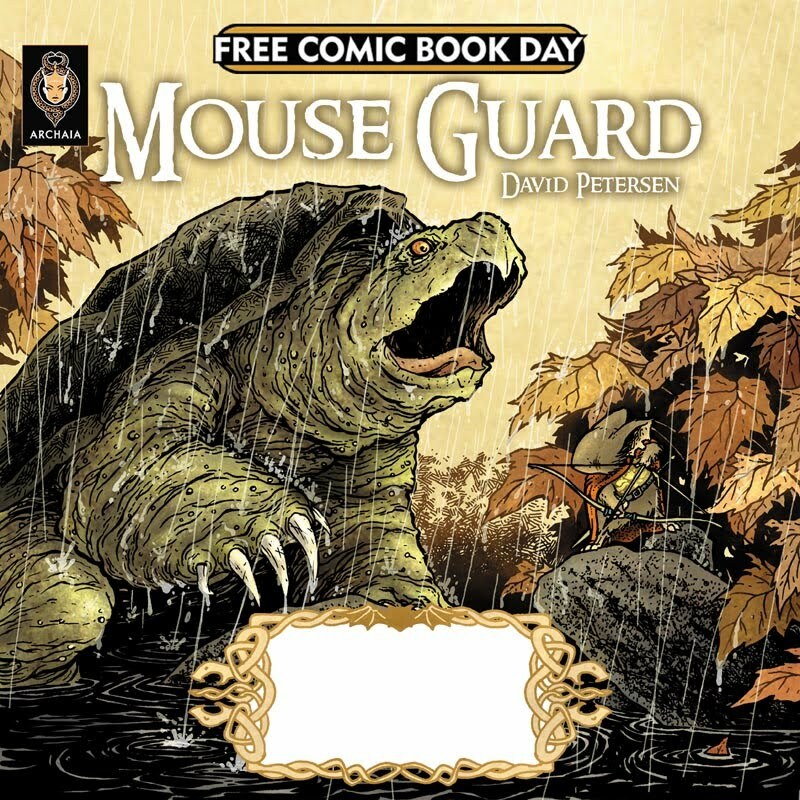 The owners of Forbidden Planet are also the owners of Titan Books, who publish the UK editions of Mouse Guard. It was a great opportunity to talk to them and be able to chat about the book's performance as well as looking forward to future UK versions of upcoming Mouse Guard books. 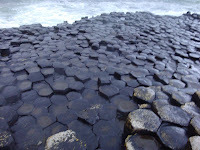 With just under two weeks over there, we had a lot of places to see and talk about, and get reference images from, but among them some of the highlights are the Trinity College's long room, the Book of Kells, Giant's Causeway, Newgrange, Christ's Church in Dublin, Fairy Glen in Rostrevor, and damn near all of London. Special thanks to Darcy & Eoin McCartan, Mat Allen, and the folks at Forbidden Planet in London for making sure we had such a good time!